You are here: Home / Retirement / It’s National Save for Retirement Week – Let’s Party! It’s National Save for Retirement Week – Let’s Party! in a rare act of wisdom has designated October 21-27 for Americans to focus on saving for our retirements. Now I’m not one for what I deem contrived holidays. Just ask the lovely Mrs. The Chicago Financial Planner. This past Saturday I dropped $3.99 (plus tax) on a Happy Sweetest Day helium filled balloon, the first time in our 28 year marriage that I have even acknowledged the existence of this florist contrived day. I will say her reaction was well worth the money spent. However, any event that highlights the need to for Americans to address the impending retirement savings shortfall that many of us are facing is a good idea in my book. A recent study by the Employee Benefit Research Institute found that even working until age 70 will not solve that lack of retirement savings for many workers. They found that even an additional five years of work will leave about 80% of current pre-retirees short of their retirement income needs. Save early and often. Starting with your first job, try to save at least 10 percent of your gross income before you get used to spending your entire paycheck. A good place to start is with your 401(k) plan at work. Make sure at a minimum to save enough to take full advantage of any employer match. Take appropriate investment risks. I’ve read several articles discussing how some younger workers are quite risk averse in the wake of the 2008-09 market decline and are investing their retirement plan accounts accordingly. This is a huge mistake. I have a 24 year old daughter. When she asked me how to invest her 403(b) plan account at work, I suggested that she allocate 50% to a total stock market index fund; 40% to a total international index fund; and 10% to a total bond market index fund. I further suggested that she do this through thick and thin, set her account to auto rebalance semi-annually, and that we’d revisit her allocation in ten years. Younger workers have the gift of time on their side and should take appropriate investment risks. Workers who are nearer to retirement should also take age-appropriate risks. This will vary, but in my experience most investors need a growth component in their portfolios. Make retirement savings easy and automatic. While some might bash 401(k) plans (in some cases deservedly so) a workplace retirement plan is an easy, painless way to save for retirement. Unless your organization’s plan is just terrible, participate and contribute as much as you can. The convenience of having the money come out of your paycheck automatically trumps a lot of ills in my opinion. 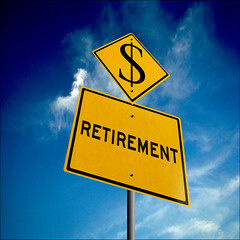 Start a retirement plan if you are self-employed. Self-employment has many pluses. A minus, however, is the need to fend for yourself in terms of employee benefits and in saving for your retirement. There are several options here, make sure to start your retirement plan as soon as possible. You work too hard not to. Get a financial plan. Whether you do it yourself or you hire a professional, get a plan in place, review the plan annually, and adjust as needed. What steps are you taking to ensure that you are financially prepared for retirement? Please feel free to contact me with your retirement planning and investment questions. How Confident Are You About Retirement? I really liked the advice you provided to your daughter. It’s what I call a “balance-aggressive” approach. You are right. A lot of young people are becoming risk averse because of what they experienced during the financial crisis, high student loan debt, high unemployment, and experiencing parents job losses. Good stuff! Thanks Ornella. My daughter was very excited about her 403(b) and she should be, they match 2x on up to a 5% employee contribution. Thankfully all three of our kids are pretty money savvy. Nice post. I never knew of this “Holiday” either. Great points on some basics of what to do. I think many people forget the time aspect which is just as powerful as the money saved, if not more. Even if it’s a small amount in the beginning, it’s key to master that discipline and get the growing started so you don’t find yourself with not enough money when the time comes. Thanks for the comment John. The combination of regular retirement savings and time are the most powerful tools that younger savers have going for them. Even if someone can only swing a small amount at first, many companies have a feature that allows for auto increases for contributions each year. This is a great tool for gradually upping the amount saved in a relatively painless fashion. I couldn’t agree more with your comment on the importance of establishing that savings discipline early on. I’m not giving in on Sweetest Day, but I can get behind this one! I agree with the importance of starting to save right off the bat…I think that is at least as important as investment returns for most individuals. Thanks for the comment Kevin. I’ve actually read studies that say that the amount saved for retirement is the single most important factor in determining retirement success. Great idea to promote getting prepared for retirement!! As the boomers age, the pressure is really on for many folks to ramp up their retirement savings!! The key is to start preparing, at any age, no matter how scary. Thanks for the comment Barb. You are totally correct, starting is often the hardest part for many folks. Roger – having a party is a waste of money that could otherwise be put into a retirement savings account. The greatest barrier to retirement savings is DEBT. The guidance is work at what you love doing as long as you can and age 95 is the new 65. Your other mission, if you decide to accept it, is to harness the energy of the many groups like Center for Financial Literacy, PFEEF, America Saves, PSCA and all the others who advocate retirement savings. There should be a National Save for Retirement DAY, which is every pay-day. The shortage of personal retirement savings and insolvent public pension plans is a problem TOO BIG TO BAIL. Aloha! Peter thanks for your comment. We both agree that anything that raises awareness of the pending retirement shortfall is a good thing. As far as insolvent public pensions I live in IL, perhaps the worst state in terms of the state of our pension system. As far as throwing a party, life is too short not to enjoy yourself once in awhile.